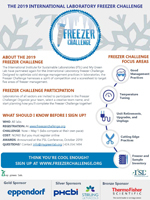 Laboratories from around the world will compete in the 2019 International Laboratory Freezer Challenge to improve sample integrity, increase energy efficiency, and save money. The deadline to sign up has been extended to May 15. Check out last year's winners and the benefits of joining the Challenge to get inspired. Participants will receive tips on good management practices, temperature tuning, and technology retirements and upgrades to reduce the environmental impact and energy costs of their labs. The winners will be recognized at the 2019 I2SL Annual Conference in Denver, Colorado, October 20-23. View an article in Nature, the weekly scientific journal, on the results from the 2018 Freezer Challenge. Visit the Freezer Challenge Resources page to view the webinars "Decrease Energy Usage in the Laboratory With the Next Generation of Sustainable Ultra-Low Freezers" and "Beyond Power Consumption: Storing Efficiently at -80C."